can we still be a backer? if not when can we purchase full copy? I want to ask about the jet license, is this game going to rent those license like Ace Combat or make a fake name for the jet? I know it's not cheap, but what is the team planning to do? What different feature can we expect in this game that makes a difference compared to the Ace Combat? As the team that had said the game was inspired by Ace Combat, so of course, we are going to expected some similarity, but also should there be something new in this game? We know one of the hardest things is writing the main story for the game. 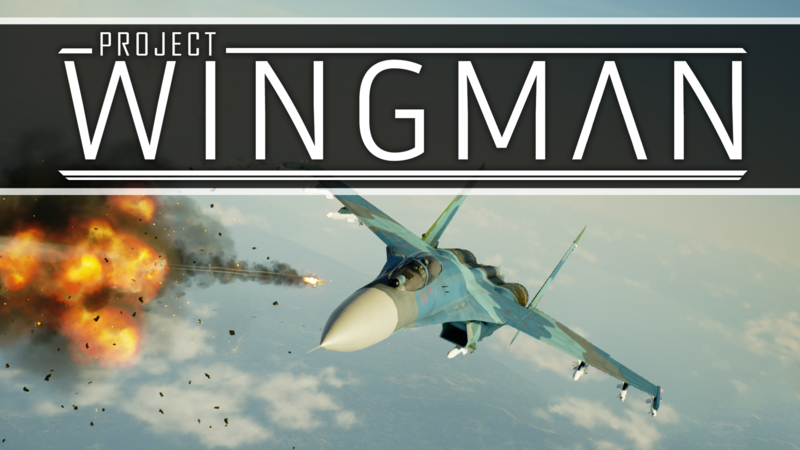 The Ace Combat had created a parallel world, so what is the plan for the Project Wingman? We know there is a campaign, but we don't know what story going to be, is a story that happened in the real world, or the team decided to make a new one? There is more I would like to ask, but I don't want to put too much pressure on you guys. I played the demo just now and I think its great. No matter what changes you make in the future, please keep as an option the simplicity of play that it is now. I hate when devs try to make it too realistic and then the fun is down. So all I am asking is that if you do make it more complicated to play in the future, just keep the way it is now as an option. If you keep that I'll have no problem purchasing the game!! Oh and by the way are you going to include VR support for Windows Mixed Reality Headsets like Samsung's HMD Odyssey. I played the demo, I love the violins in the soundtrack. I see a lot of potential in this very arcade-ey game, and it looks like it will be a ton of fun to play through a campaign. I'm sorry I missed the kickstarter. I only have 2 questions as a newcomer: "How much do I need to pay for this honestly entertaining project?" And secondly, "When can I pay you the money?" Love your cockpit perspective,HUD,UI,effect,and especially the gun's handle. Looking forward to your complete version! Any chance to add FOV for We use 3 monitors? this is awesome! the game gave me so much fun and i have really enjoyed it! but i think the sound effects of some points in this game are little bit weak. like, when missile explodes or when aircraft get closer to each other or it explodes. it would be better to improve the sound effects more rich and realistic. I signed up to say that this "Alpha" is more polished than most full release titles nowadays. How can I pre-order this game? Looking forward to VR support. Excellent game thank you for creating this! P.S. to everyone trying this demo: turn off music and put some headphones on. thx. for your reply. got it sorted a couple of days ago. i am playing this more than my x-plane. graphics not bad. anyone if you can land and take off? hello all. i am a xplane 10 user. then i came across this. very nice. one problem, my saitek 52 pro does not show up. any help much appreciated. I had the same problem. Just go into controllers in settings tab and click the key you wish to map. Your controller will appear in the box with the assigned key. Hope this helps. hello. just downloaded. exactly what i was looking for. need howto to bind saitek x52 pro. tx in advance. any help is much appreciated. It is a wonderful game honestly, I love the atmosphere change when you dive from above the clouds to below them, it feels.... real, and the way it handles with mouse aim feels like you are playing war thunder except on a fa18 hornet. However i think the mouse aim could need some more improvements to make it easier to use, other than that well done. Great! I will waiting for the campaign mode! Hello. This game is getting better on every update. Keep up the outstanding work! This really deserves; "Made with Love and Dedication". AMAZING DEMO... Just that when i tried to bind my Logitech X56 H.O.T.A.S it seemed that is did not like way it was set up. I could control the plane but i know could be lot better if had a preset for Joysticks like the X56. Another item i could not seem to find was the CHAFF system to avoid the missiles coming at me sure you can only avoid so many but in the sim when you have 4 lots of enemy planes coming at you from different side hard to miss being hit when locked from behind & in front. But i can tell from the demo that this is going to be a GREAT SIM when the VR is working has well OMG if you have like CO-OP with up to maybe 3 friends to make a 4 Plane squad so then its 2man team to look out for each other has well taking out the enemy targets because like on a ground assault you could have 1st 2 planes just ahead of other 2 for air to air or air to ground so that you clear the way for the other 2 that are carrying the bombs for the mission. Ran on my 1080 card np with no lose of FPS & setting was between High & Ultra. Holy moly. Love this. Like ace combat but without the cheese. Presentation is STELLAR. My only gripe is that I like to play without the hud so I have to use my eyes and physical equipment to know whats up. It's annoying to have to cycle through the targets to get a missle lock on someone, only because I cant see who is selected on the hud. anyways, thanks a billion. This rocks. Enjoyed the demo! great work!! I did get the odd freeze for like five seconds, i did drop down some of the graphic settings which helped but still got a occassional freeze. I only discovered this game today, so i dont know much about it. But i do hope there will be some strategy involved in terms of a campaign map and you choose order of attacks which can impact other missions if you do poorly or choose poorly etc. I couldnt work out how to fire chaff. Look forward to playing the demo some more and will look into this game some more. Thanks for the demo. I love it! GOOD JOB Developer! As a fan of the Ace Combat series, I can say that your game is great, instantly one of the best of its genre. It has all the things I could ask for. I'm running the game on my 7700hq and a GTX 1060 3gb and it was buttery smooth, like AAA buttery smooth. I love how the game looks, especially when the "Atmosphere" changes when below or above the clouds, I just love that. Other than that, I wish the UI/HUD was resizable, hopefuly more planes. I know everything is going to be rehauled like effects and textures are gonna be better (not that it already is beautiful) I cannot just wait to see this game out there more in the future. This game has a lot of potential, like really, I can see this mainly as a multiplayer but continuing on adding stories to the campaign as well will give this game the boost that games like ace combat didn't really have after finishing the story. I hope your doing good developer! Keep up the great work! The music tracks are pretty awesome btw, but I would also suggest an option to allow custom mp3 tracks while playing. If you want to get really fancy an api to allow someone to determine the angle of the plain in realtime, Then advertise on hackaday for someone to hookup a makeshift flight sim tilt machine. Hey I saw your last update and I'm glad you added thunderstorms. Though there is something I really would like to see. Do you intend to implement giant clouds like there are in ace combat 7 ? Because in the demo there is just a layer ( which is awesome in itself ). The game reacts a bit weird when I tried to rebind controls, other than that it's perfect! I have a suggestion, tho: Try shrinking the weapon panel and radar map by 30%, because it looks a bit messy with current size, enemy tags can be a bit simpler, too. Just enjoy the demo and trying to invite my friend to play together. But is there any chance for us to have a multiplayer mode? Especially multiplayer coop mode because we don't like to fight eachother. Hey there, looks like a great game, however, my Logitech X-56 mapping is all screwed and i don't seem to get a grip on how to rebind it, is there a profile i can download or a tutorial? 1. Do you intend to continue to add missions once the program comes out? 2. Will users be able to save & upload missions for others? 3. Will we have a fully functioning carrier with an Optical Light System we can actually see? It's solid as a rock at the highest settings. Well done! Intel i7-4770 cpu@3.40GHz. 16 GB of ram. Nvidia GTX-1070 GPU (stock). Looks good,but i click "Launch" and it doesnt run,just keeps saying "Running"
This is beatiful, it runs a little unstable (easily drops frames) but nothing beyond that. Does this game have VR support? I just got done playing it for a solid 8ish hours, and it was so much fun, the only thing i think it REALLY needs is more aircraft. You face F-14, F-15, F-16, and F-22 and i would like to see them as player controlled aircraft. That's really the only thing i see wrong with this game. Good job keep up the good work!! Windows says when i start the exe that it my be a virus and i have to accept to run i think you know that window (is just a fix for looks you can do) but good gaame i like flight simulations ;) espacially with fighting. Whats the difference between the normal download and the alternate link? thank you. Why the QAAM has been removed in version 0.3.9,I hope that will rejoin at the future. And I like the font of the old hud more than the new. Request persmission to upload gameplay of mine to YouTube? people have been uploading gameplay videos of PW for a while now. you should be good. What a game. Finally got to give it a good couple hour long session and I have to say I love it. I can only think of a few things I would really like to see. Smooth graphics, smooth controls, smooth gameplay all around. I do wish I could manually release flares. It is annoying having to juke when youre in the middle of a particularly nasty dogfight. I am trying the conquest/prototype mode right now and I love the difficulty level. Not too hard not too easy. All in all great game. Especially for a demo. Can not wait to see the finished product. plays great, currently suffering from a problem with xbox one controllers, my key bindings are a little off for optimization and my right trigger can't be reassigned away from right yaw. I think you need to have an option to delete an input if you try to create a duplicate. Makes playing this particular version impossible for an xbox controller. I'll look into this, Thanks for the feedback! Sorry about this. You might be able to fix it by deleting the user config of Project Wingman in AppData.